Much like its dining scene, River North’s drinking culture comes with a lot of over-hyped, under-delivering bars and clubs. However, if you’re willing to dig just beyond that glossy façade of bottle service and ubiquitous “handcrafted” cocktails, you’ll find a handful of spots that are truly worth their salt. 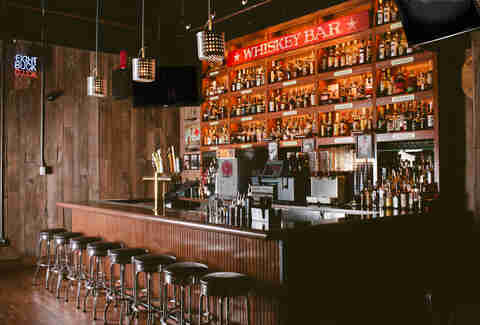 Here are the 11 best places to booze in River North. Armed with 150 whiskeys, Lettuce Entertain You’s Southern-inspired concept is an obvious choice for connoisseurs and casual drinkers alike. Come down for live country karaoke every Tuesday at 10pm, and a killer weekend brunch, flush with gut-busting comfort fare. Where else in the neighborhood can you grasp a can of Half Acre Daisy Cutter in one hand and a gaming controller in the other? Nowhere, that’s where. 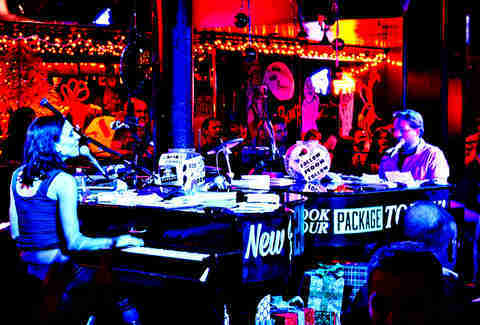 Dueling pianos playing danceable beats? Check. Energetic vibe? Yup. Plastic buckets overflowing with neon-hued sharable cocktails? You betcha. With 114 unique varieties of domestic and international beers, this colossal hall hosts Chicago’s largest draft selection. Overwhelmed? Get your feet wet with a flight -- curated or build-your-own -- and then dive into the 2013 Hamburger Hop-winning Kimchi Burger. 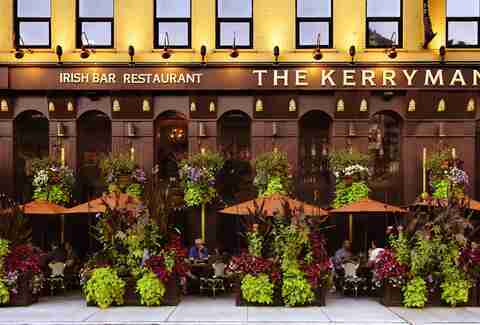 Effortlessly bridging the gap between raucous sports bar and casually elegant eatery, The Kerryman delivers whether you’ve come for a Notre Dame game or just a fish & chips and cold beer fix out on the lush, jungle-like patio. Chef Kevin Hickey and the Rockit Ranch Productions gang’s fancy bar snacks -- like braised beef cheek poutine and a bag of sea salt and malt vinegar powder chips tossed with an egg -- complement head barkeep Brandon Phillips’ inventive cocktails beautifully, so if you’ve never thought to yourself, “The only thing that would make this cocktail even better is a side of popcorn sweetbreads,” you should now. Wrapping around the 16th floor of Trump Hotel Chicago, this seasonal sky-high lounge offers unparalleled views of Lake Michigan and the Chicago River. 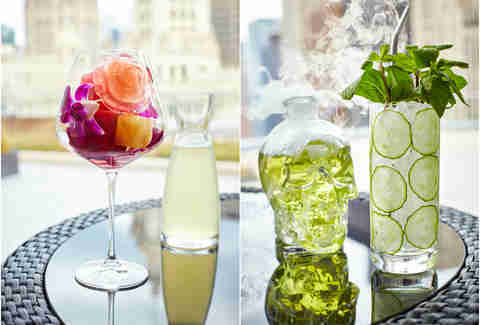 Drinks are exquisitely balanced, and some include flavor-infused ice cubes to make ‘em good to the last drop. Catch fireworks on Wednesdays and Saturdays all summer long. When a bar’s beverage menu is equipped with a table of contents, you know it means business. Balanced and blended with top-shelf booze and predominantly local juices and herbs, each cocktail offered is a veritable work of art. Overwhelmed by all the options? 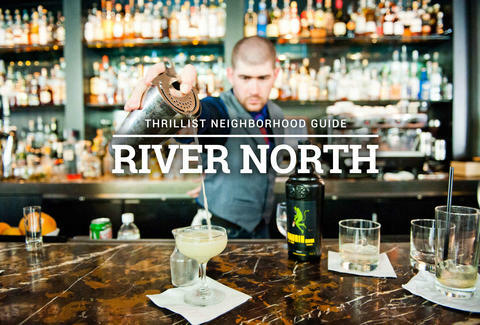 The refreshing, gin-based War of the Roses and warming East of Omaha are perennial standouts. With its weathered awning, unassuming Rossi’s is a breath of fresh air from the neighborhood’s swankier spots -- provided your idea of “fresh air” includes inexpensive drinks, a jukebox, and remarkably diverse clientele. 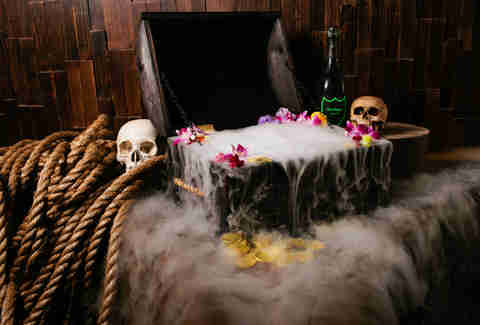 This subterranean retro Tiki lounge from Lettuce Entertain You is easy to find -- just look for the line that wraps around from the back-alley entry. There are over 200+ rums, which means you'll never have to ask, "Why is all the rum gone?!" like Johnny Depp did in that delightful fantasy swashbuckler film based on a theme park ride. Light and airy in daylight and demure in the evening with $1 oysters on Tuesdays and Thursdays, this Champagne bar has remained River North’s go-to for après-work bottle popping and toast-worthy celebrations since 1982.